Chicken satay are one of my favourite appertizers in Asian cuisine. Chicken satay originates from Indonesia and it’s not even a Chinese food. However it’s very popular in Chinese takeaways and you can see chicken satay on almost every Chinese takeaway menu in the UK. I use Chinese white sesame paste as one of the main ingredients to marinade chicken satay but you can also replace it with tahini sauce or even smooth peanut butter (please note, use smooth peanut butter and not the type that contains chunks of peanuts). I also use Chinese barbeque sauce (Shacha BBQ sauce 沙茶醬) for marinade. This Chinese barbeque sauce is a famous condiment or paste in South East China and also Taiwan. It is made from soybean oil, garlic, shallots, chilis, brill fish and dried shrimp. It taste savory, spicy and pungent. Chinese and Taiwanese people usually use this sauce as a dipping sauce for hot pots as well as a rub for barbequed meats, seasoning for soups with and without noodles and also stir-fry dishes. You should be able to purchase Shacha bbq sauce in almost every Chinese supermarket on the condiment or sauce shelf. After you have opened this sauce make sure you keep it in your refrigerator. You can use chicken breast or chicken thigh fillet for this recipe, it’s up to you. If you use chicken thigh fillet cut them into dice. This will make it easier for you to bbq or char grill them. I usually marinade the chicken satay overnight for a better taste. 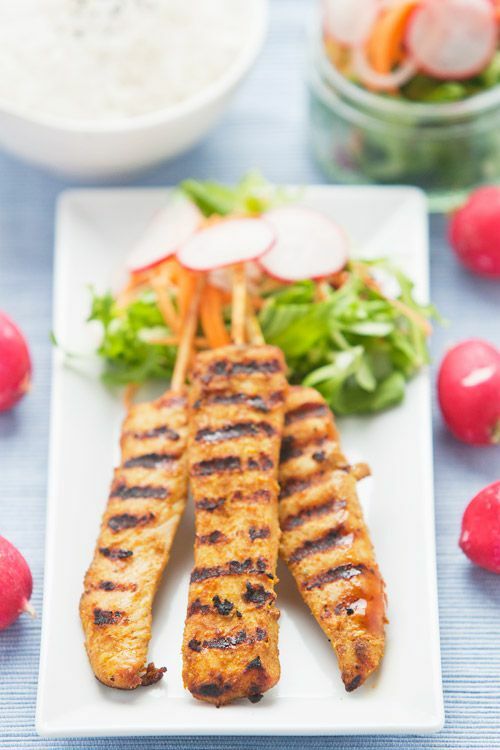 You can prepare this chicken satay ahead and in large quantities for your bbq party. Make sure use soak the bamboo skewers or wood skewers before you bbq the satay. This will prevent the skewers from burning during cooking. I also make some pickled vegetables to go with this chicken satay as the sweet and sour flavour of pickled vegetables will really fulfil your appetite during the summer time. You can serve the pickled vegetables on the side of your chicken satay or even mix the pickled vegetables with some salad leave to become a summer pickled vegetable salad. Marinade chicken breast with all of the seasonings and store in a fridge for at least 1 hour. Soak bamboo skewers in water for at least 30 minutes. Skewer the chicken breast and char grill or barbeque the satay until it’s cooked. Ready to serve. Slice the shallots and radish in thin slices. Shred the carrots. Boil all the seasonings from Sichuan pepper to the sugar in a saucepan. The dish is now ready to serve. You can mix this pickled vegetable with some salad leaves or just serve on top of the salad leaves.